This may not be on the top of a must-stay list, but as one of the nicest hotels in the Rochester, NY area, it should be at the top of your list if you are in the area. This hotel is located in my hometown, so it is an area that I know fairly well and have been in for a while. Not only am I familiar with Rochester, but I am also familiar with the Hyatt Regency in town. I know it is not too often that a person stays in a hotel that is in their hometown, but since it is one of the nicer area hotels, we had used it several times as a mini-getaway hotel. I also stayed there a lot recently as I worked to finish up my Hyatt Diamond Challenge. The Hyatt Regency Rochester is located right downtown next to the Genesee River. It is walking distance from many of the office buildings of the city as well as the city offices. It is also just down the street from the Rochester Convention Center. Also in the area is the Blue Cross Arena at the War Memorial, the arena where many entertainment events take place as well as the home of the Rochester Americans (“Amerks”), the local American Hockey League team. Across the river and less than a one mile walk away is another sports venue, Frontier Field. It plays home to the Rochester Red Wings, the top minor league team of the Minnesota Twins (formerly for the Baltimore Orioles). It has hosted such players as Cal Ripken Jr in his days leading up to the Baltimore Orioles as well as players like Roger Clemens who had been sent down for a rehab session with the Yankees minor league club. For kids, there is a wonderful attraction just a walk away called the Strong National Museum of Play. If you have a thing for classic toys, you will find them in here. But older toys is not the only thing here. There are dozens of areas setup for children to play and explore different things. One of the main attractions is the inclusion of a kids’ size Wegmans (the local supermarket). It is complete with pretend food and wrapped in packages with UPCs so that the children can shop, and then ring themselves up at the cash registers. My kids always love that! Finally, for music lovers, the hotel is also less than half a mile away from the home of the Rochester Philharmonic Orchestra, the famous Eastman Theatre. There are many concerts and classical performances that take place there and it is a great way to enjoy a little of the culture in the area. The hotel does offer a shuttle service to and from the airport (which is about 7 miles away). There are also shuttles offered to the bus and train station. If you are driving your own car there (recommended), you can park in the parking garage for $4 per day with unlimited in and out privileges. Just make sure you get your ticket validated at the front desk or else it will run you $12 for the day! The lobby is quite stretched out. You can access it from the covered entrance or from a long hallway to the parking garage (all covered). Either way, there are several shops on the lobby floor as well as the hotel restaurant. For check-in, there are about 4 or 5 desks but I have only ever seen 3 agents working. There is an aisle for Platinum or Diamond members, but my experience has been that choosing either aisle will get you the same service. In fact, one time I was standing in the elite line as the first customer in it and there were other customers that were being waited on. I watched as the agent kept inviting people up from the general line even as they were walking in and getting there well after I was standing there. When I mentioned it, she told me that she only handles general customers. What? In spite of that isolated incident, I have always found check-in to be quick and smooth (once I got to the counter). There were a couple of times that I had to mention about my Diamond amenity because they had forgotten, but each time I was recognized as a Diamond (or Platinum, when I stayed there at that level) and informed of what I would receive. There are two main categories of rooms. The Standard rooms and the Suites. In the Suites category, there are only two types of suites, the Misc and the Presidential suite. There are a few different styles of the same standard room category. Some of them feature a slightly longer hall or a little more space in the room, but each room I received was always located above the 17th floor and was laid out in a very open fashion. There was certainly space in the room to put several baby cribs, if you had the need to (traveling with children, that is sometimes my form of measurement!). The king-size bed is a very comfortable bed with just the right amount of firmness. The pillows were also very much to my liking. I can always tell the quality of a bed for me by my ability to sleep (because I never sleep that well in hotel bedrooms). I always sleep very well here! Each room has a workstation area and computer chair as well as a sitting chair situated near the 42″ TV. The local channels and cable channels are a decent offering and the TV is a really nice size for the distance away from the bed that it is. The internet available is via a wired connection or wireless. The internet does come with a cost, but it is free for platinum or diamond members. The complimentary version is not the highest speed, but it is still completely decent of a speed to get some work done. The views out of the large windows give you the best shots of Rochester. Being on one of the highest levels in the city gives a great perspective of the city. I have only eaten breakfast at this restaurant as Diamond members receive it complimentary. The staff is very watchful and they always made sure my glass was full. The food options were expansive. There are a number of healthy options including locally grown fruits, farm-raised eggs, oats, granolas, and local jellies. In addition to the healthy side, there is also a full board of pastries and breads. It is really hard to say no to some of the breads, I mean it is breakfast, not desert! But, it is all very, very good! Another option for breakfast is the egg station. They do a very good job of making whatever you ask for. When they finish, they will bring it to your table (not sometime that I get by default at other hotels). The fitness center has 4 treadmills, 3 elliptical machines, stationary bicycles and free weights. The floor to ceiling windows overlook the indoor pool, both of which are located on the 2nd floor of the hotel. The machines are high quality and have built-in TVs – always a favorite! The pool area has the pool and a whirlpool tub. Just outside the pool doors is a balcony that looks down on the city. 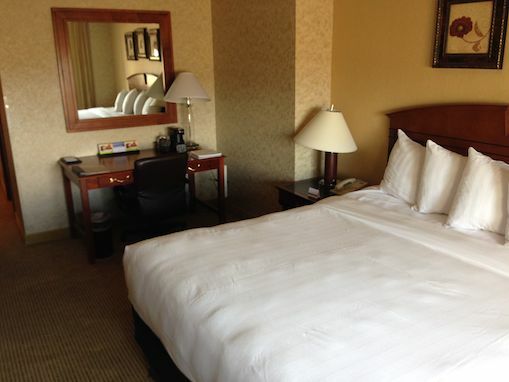 The whole area is well-kept and has very nice offerings for this business hotel. The Hyatt Regency Rochester is a Category 2 hotel. It requires 8,000 points per night or 4,000 points and $55 for Points + Cash. The regular going rate for the hotel is $129 per night (plus tax), so it makes a great deal to use the Points + Cash option, especially since you receive 1,000 Gold Passport points as your Diamond amenity. This makes it a net 3,000 point stay (plus the cash). As for using a suite upgrade, I would not choose to use it here unless you really want to get the best suite in the hotel. The rooms are big enough that most people may not need to use the suite. This is one of the best hotels in Rochester. It is not saying a whole lot since there are not any 4 star hotels (or 5) in the area, but it is still a great hotel. If you are looking to complete a Hyatt Diamond challenge, this makes a nice hotel to do it in. Not only are the rooms nice, the breakfast is definitely a huge perk and a delicious offering. The Rochester Marathon takes place at Frontier Field, so this makes the Hyatt Regency Rochester an ideal base hotel for the race. There is availability for that race (September 21), so definitely check it out for your best option. I am coming to Rochester this fall, but staying at the Strathallen which is now a Hilton. I would prefer to do a Hyatt stay, but my friends live in Park Ave area so its more convenient. I used to live in Rochester so I usually stay with friends but I will consider this hotel in the future. I had not even realized that about the Strathallen! That is nice to have that as another points option. Enjoy your return to Rochester! My brother is at UofR, how close is this hotel to the campus? I’ve never been but my parents have stayed at a Marriott, I think residence inn sever times. It is about 1.5 miles away. Not too bad.